Last year, I almost accidentally made my #IPADay. Not that I didn’t mean to make beer – that would be impressive even by my standards – but that I didn’t really know what I was making until I’d made it, and didn’t even realise IPA Day existed before I was bottling it! I’ve always suspected that the true mark of a brewer isn’t the ability to make beer, or even to make drinkable beer, but rather the ability to make the same beer more than once. So for this year’s IPA Day I have, for the first time, attempted to brew a beer I’ve made before. Perhaps even more foolishly, I’ve managed to keep a bottle from last year, to enable me to make a true side-by-side comparison – although obviously as they’re radically different ages, there will inevitably be some differences even if I’ve done a perfect job. I actually ended up tweaking the recipe a little, to slightly raise the ABV and hopping level. The malt bill remained at the same ratios – but with around 5% more malt overall – and the hop schedule is precisely as last time, but I reduced the final volume from 23 to 20 litres. The volume reduction is part of a plan to get more brewing done; as I’m the only beer drinker in the house, there’s only so many 5 gallon batches I can handle. There’s a limit to how small I can go without getting some smaller fermenters and tanks, but 20 litres doesn’t leave too much empty space in everything. Unlike the smooth brew day last time around, the day started badly as I ended up with a fairly hot mash – closer to 67 degrees than my usual 65, even after adding a fair amount of cold water to calm things down. After careful consideration, I scribbled “Sure it’ll be fine” in my brewing notes and carried on; the rest of the day was fairly uneventful, and I ended up hitting my target gravity of 1046. After a week of fermenting, it was time to transfer the beer into the secondary fermenter – until now I’ve used an ageing pressure barrel for this. 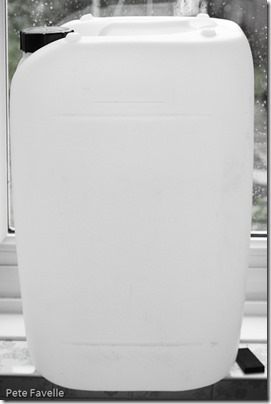 While there’s nothing wrong with that, it’s a big and rather awkward thing to have lying around, so when the lovely folk at Howling Hops asked if any homebrewers were interested in some spare containers they had, I jumped at the chance. Although they’re a much more convenient shape (and they stack! ), the downside of these new containers is that the caps are roughly half the size of my old barrel – which made adding the dry hops a slightly messier process than normal. I probably need to find some sort of funnel that will leave the kitchen less hop-coated! Another week on, and the beer was ready for bottling; as with the last brew I batch-primed the whole lot, although rather foolishly I used the same 2/3rds of a cup of sugar despite the batch being quite a bit smaller. Drinking the dregs after bottling was obviously a lot sweeter than I was expecting, therefore, and I was convinced that my earlier overtemperature mash had spoiled the entire batch. After a couple of weeks in the bottle, though, it had settled down into a very drinkable IPA – a little lively sometimes when opening a bottle but aside from that, far better than I dared hope. Now comes the moment of truth – I haven’t actually even looked at the old and the new side by side, let alone tasted them together. So, how to they compare? 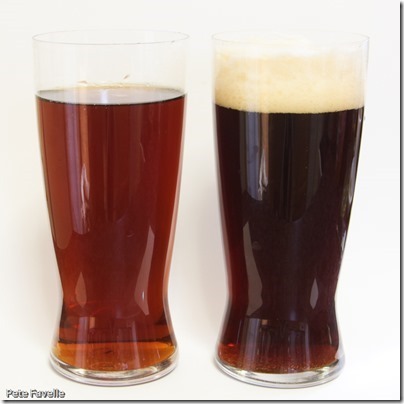 Well, two things are immediately obvious – firstly, the new version (on the right) has way more head; this is largely down to the heavier priming, although the fact that last year’s beer is a lot older probably doesn’t help. Secondly, the new version is also darker. This makes perfect sense, as it’s stronger. In hindsight, I should have modified the malt bill to take this into account but in my defence, I’ve never really considered the colour of my beer before. On the nose, they both have a similar biscuity malt backbone. The old beer has a suggestion of autumn fruit lurking underneath, but has lost a lot of it’s hoppy character. The newer beer is fresher – still more fruity than floral, but strawberries and a whiff of orange blossom. In the mouth, the old beer tastes a little tired and is clearly past it’s best. The bitterness from the hops is still there, and a little caramel, but it’s very one dimensional and lacks the sweeter flavours. The newer beer is a delight; nicely foamy in the mouth from the heavier conditioning, a slightly more aggressive bitterness that comes in after a nice sweetness on the tip of the tongue, along with a delicate, soft fruit. The finish is dry and lingering and leaves you crying out for another bottle. All that said, the beers are clearly at least cousins – they are way closer than my first all-grain attempt at a Bitter & Twisted clone, for example. 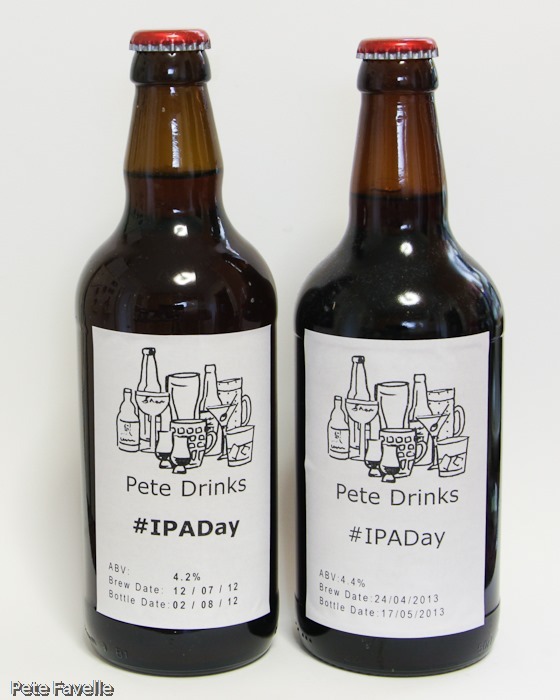 Looking back at my post about the original #IPADay, the tasting notes at the end could easily apply to the current incarnation, so I’m happy to say that aside from the colour issue – which I can address in version 3 – I’ve pretty much hit the nail on the head!